Space shuttle Discovery is seen pulling up to the International Space Station on Feb. 26, 2010 during docking day for its final space mission STS-133. Italian astroanut Paolo Nespoli took this photo from inside the station. 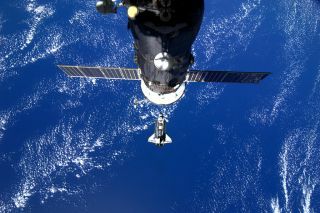 A Russian spacecraft is visible at top. NASA's space shuttle Discovery left the International Space Station today (March 7), after delivering not just supplies and equipment, but dozens of scientific experiments. The space science projects run the gamut of topics, from biomedical studies to materials science experiments. Some of them were carried out during the flight – Discovery's final mission – while others were left on the space station for the long term after the shuttle undocked from the orbiting lab earlier today. But all the experiments have a similar goal: to take advantage of the unique conditions space offers to derive key insights. It may seem strange, but boiling things could be a good way to cool down electronics in space — and a new experiment onboard the space station will study how to put this phenomenon to best use. In space, bubbles created by boiling water tend to be bigger than they are on Earth. Bubbles in space grow to different sizes than they do on Earth, for example. The new Nucleate Pool Boiling Experiment, or NPBX, that Discovery carried up to the station will look into just how different space bubbles can be — and how to harness the heat-transferring potential of nucleate boiling, researchers said. "The cost of transporting equipment to space depends on the size and weight of the equipment," David Chao, NPBX project scientist from NASA's Glenn Research Center, said in a statement. "The knowledge base that will be developed through the experiment will give us the capability to achieve cooling of various components and systems used in space in an efficient manner and could lead to smaller and lighter spacecraft." Something about spaceflight can make astronauts sick — they become more susceptible to infections during flight and immediately afterward, scientists have found. A new study that Discovery's flight made possible is looking into why this may be, with the aim of keeping astronauts healthy and protecting Earthbound folks with vulnerable immune systems, such as the very old and the very young. The experiment focuses on 16 mice floating in containers on Discovery's mid-deck. When the rodents return to Earth after their 13-day spaceflight, half of them will be infected with a common respiratory virus called RSV, researchers said. So will another group of mice that stayed on the ground, in otherwise comparable conditions. Researchers will then study the mice's repiratory systems to see how the virus has affected them. Comparing sick space mice with the infected Earth rodents will allow them to gauge the impact of spaceflight. "We have substantial experience using mice to study immune response to RSV infection, and that will enable us to look at all the aspects of the immune responses of these mice as well as the pathological manifestations of the disease, looking at ways in which the space environment affects this respiratory infection," project leader Roberto Garofalo, a professor at the University of Texas Medical Branch at Galveston, said in a statement. Discovery launched on Feb. 24 carrying three different experiments to study cell growth and bacterial development under microgravity conditions. One is examining a drug-resistant strain of the bacterium Staphylococcus aureus, with the goal of developing a vaccine that will prevent infections on Earth and in space. The other two experiments are investigating how microgravity affects cell and plant growth. One of these studies is looking at cucumber seedlings, while the other is studying a plant species called Jatropha curcas, which is a source of biofuel. The research could potentially lead to new, more productive strains, NASA officials said. Three different studies are investigating how long-duration spaceflight affects the human cardiovascular system. One will quantify how much — and how quickly — heart muscle wastes away during space missions. The others looked at how spaceflight affects crewmembers' blood pressure and blood vessels, officials said. Two nutritional studies also launched on Discovery's STS-133 mission. One investigates whether a diet rich in potassium — and relatively low in animal protein — can help stave off astronaut bone loss, a common side effect of extended spaceflight. The other looked at the mechanisms of fluid and salt retention during spaceflight. Another experiment is studying the risks to the human immune system during spaceflight, NASA officials said. Astronauts aboard the space station will perform the NPBX bubble experiment and another one that also studies how boiling liquid in microgravity differs from boiling it on Earth. Both experiments will use a new facility, called the Boiling Experiment Facility, that Discovery delivered to the orbiting lab this flight. Discovery's mission has upgraded the station in other ways, officials said. For example, the shuttle's six-astronaut crew installed some new equipment-holding racks that will expand the science capabilities of the orbiting lab. The shuttle also delivered a humanoid robot called Robonaut 2, which will stay aboard the station and help astronauts out by performing various tasks. Station crews will use the robot as a test bed to help develop more advanced robotic helpers in the future, officials have said. It is slated to be powered up for the first time sometime later this month, they added. Discovery's current mission is the shuttle's 39th and final flight before being retired along with the rest of NASA's reusable space plane fleet. NASA is retiring its shuttle fleet to make way for a new space exploration program aimed at sending astronauts to asteroids and Mars. Once Discovery lands, only two more shuttle missions remain before the fleet is retired for good after 30 years of spaceflight. The shuttle Endeavour is due to launch its final mission in April while the Atlantis orbiter is scheduled to fly for the last time in late June. Discovery, NASA's most-flown space shuttle, is due to land at the space agency's Kennedy Space Center in Cape Canaveral, Fla., on Wednesday, March 9.